Mobile phones, tablets and computers are all a part of our lives, and they deserve a prime parking spot. But how many times have you come home to recharge your devices while they’re barely hanging on to the last power bar only to find that all the easy-to-reach receptacles are already occupied, forcing you to surrender to a less convenient area…like behind the sofa or by your bathroom sink? 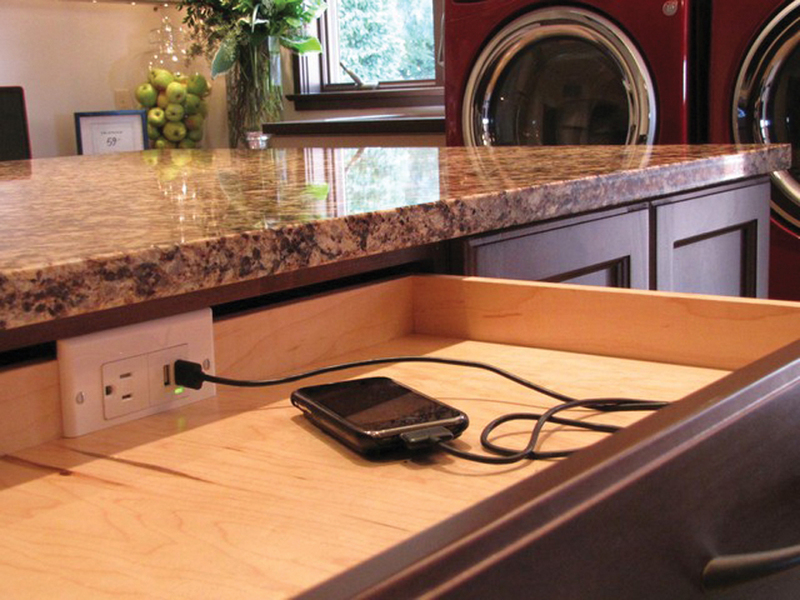 We can help you incorporate a dedicated charging spot into your home design so the Battle for Battery Power can be over, and you can take charge of your charging. It’s what your mother always told you: a place for everything and everything in its place. Deciding upon your devices’ resting place should be the first step. Many people choose the foyer, where you most likely hang your coat and drop your keys and mail. If you enter a back door, it may be a laundry room or mudroom that becomes the drop-off point. Other people choose the kitchen —the most obvious family-gathering spot—and some choose bedside for easy retrieval during the night. If you are like many people who have said goodbye to landlines and become a sole cell user, you will want to think about the most convenient place to retrieve calls while at home. 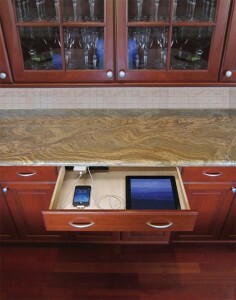 The kitchen provides perhaps the most flexibility, with so many cabinets and drawers to neatly tuck devices away. Some people have chosen a shelf in their pantry. You can place a simple wooden cube shelf (available at almost any home decorating or big box store) on a pantry shelf or inside a cabinet to create an instant cubby for your own device, provided it is close to an electrical outlet. 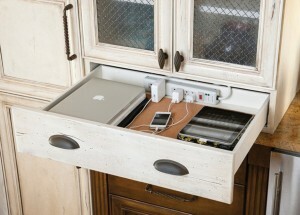 If you have a built-in desk in your kitchen, a charging box or drawer could be the best solution for hiding cords. If you are building a new home or planning a remodel, consider working a charging spot into your design, taking into account the needs of everyone in your family. Choose designated spots for all family members. If several people use one spot to charge everything, use name labels for each connection. 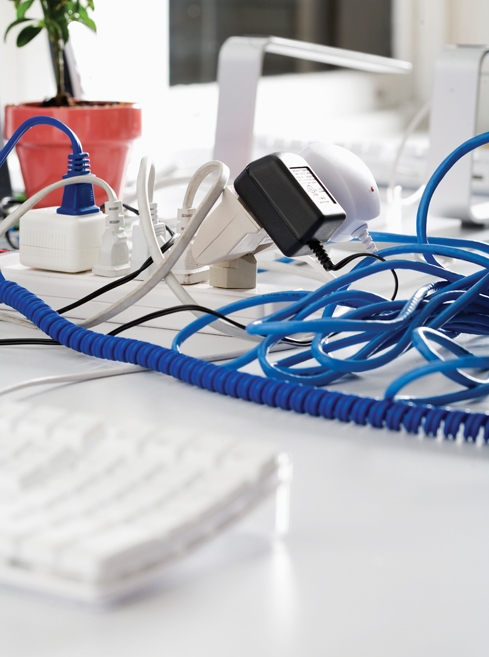 Cord clutter is a nonstop problem for anyone with more than one device. Even if you are lucky to find an empty outlet, keeping cords wrapped up nicely so they aren’t hanging over a counter’s edge or sprawling across your canisters and appliances is difficult. There are many products on the market today to help you tidy up the mess—or at least hide it. Containers made specifically for charging devices are widely available, from simple desktop boxes made of paperboard or faux leather with holes for cords, to mahogany valets with tiny, shiny, drawer pulls. In most of them, you can place your chargers in a lower, hidden area of the box, with the cords running through small holes and the devices docked on top. These stations only require one power cord to your wall outlet; basic, inexpensive models start as low as $20 and run up to several hundred dollars. If you can spare a kitchen drawer, you can make your own docking station by hiding a power strip in the drawer and either running it behind the cabinets to a nearby outlet or making a hole for the cord in your countertop, if possible. You can also make your own countertop charging station from a photo box or decorative box from any arts and crafts store. Cut a small hole in the back that is large enough for a power strip plug, then cut a horizontal slit along the front where your charging cords can come out; devices can rest on the box lid while charging. A basic online search for “make your own charging station” will pull up many ideas—including a charging station made out of a bread box! Freeing up your wall outlets for other everyday electrical uses, like your laptop computer, CD/radio, or even the slow cooker if you find yourself charging things in the kitchen, can be even easier with new USB-port outlets on the market today. Outlets can now be purchased with combinations of USB ports and standard plugs to replace your old outlets for as little as $20 to $30. You can charge your device directly from a USB port in the wall and cut out the need for a bulky adapter while also freeing up standard plugs for other appliances and devices. The faceplates are the same size, or slightly larger, than the standard electrical faceplate, and many have an LED light that will illuminate when the USB is in use. 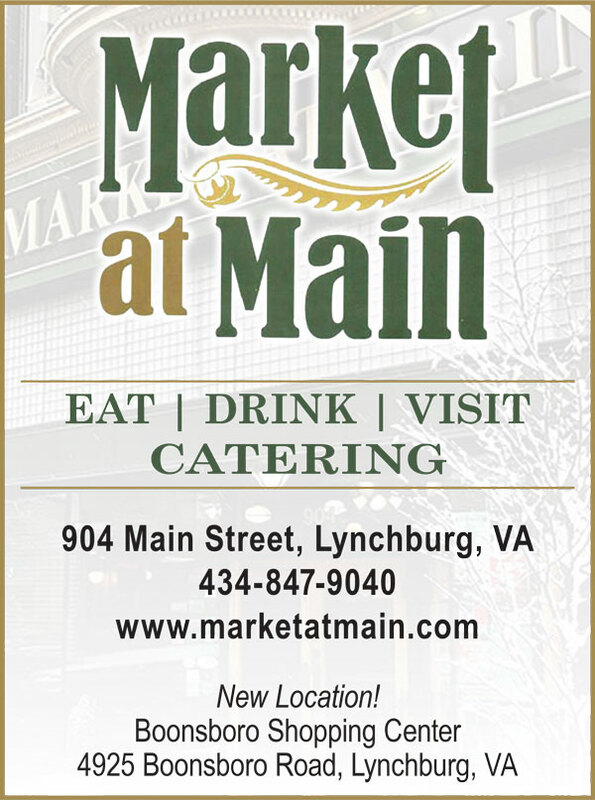 Misty Hook, co-owner of Wired Up Electrical in Lynchburg, says there are many different models of outlets that integrate USB ports. She says her company has installed these new electrical outlets with USB ports into all manner of cabinetry, from the kitchen to the bathroom to the office. “The convenience factor with a USB port outlet is you don’t have to have the transformer [AC adapter] sticking out from the wall,” she says. Although these products may be sold inexpensively at home improvement stores along with installation instructions, many homeowners are “afraid to get that far into it,” according to Hook, and wisely don’t want to take the risk of dealing with voltage. These new outlets are also a bit bigger/deeper, and old homes may need larger junction boxes installed in the wall to hold them, possibly requiring some drywall cutting and patching. She recommends calling in the pros to handle this home improvement task. Hook says that one of the most popular places homeowners want to incorporate USBs is in their home offices. People want to work at a computer, pay bills, set the family’s schedule or browse social media between multiple devices while not sacrificing any battery power. 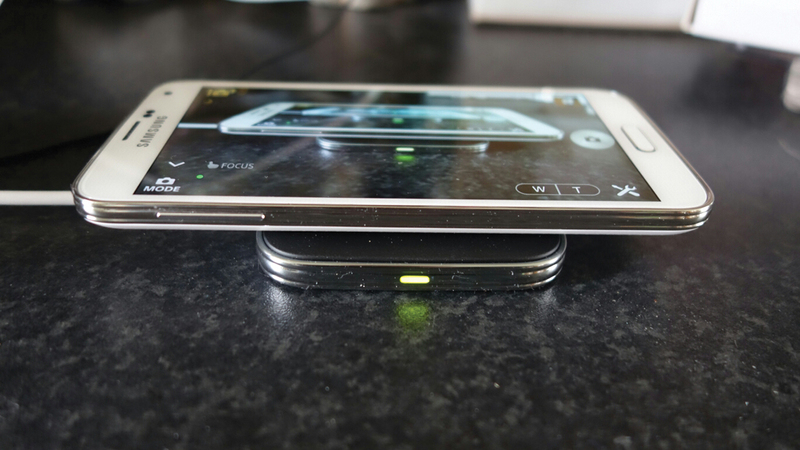 The latest charging products on the market may have more of us tossing those cords altogether. 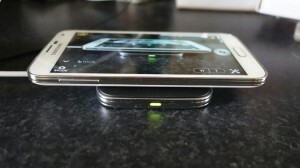 Wireless charging pads, or mats, that use “inductive charging” (passing the energy on through an electromagnetic field), have entered the industry. 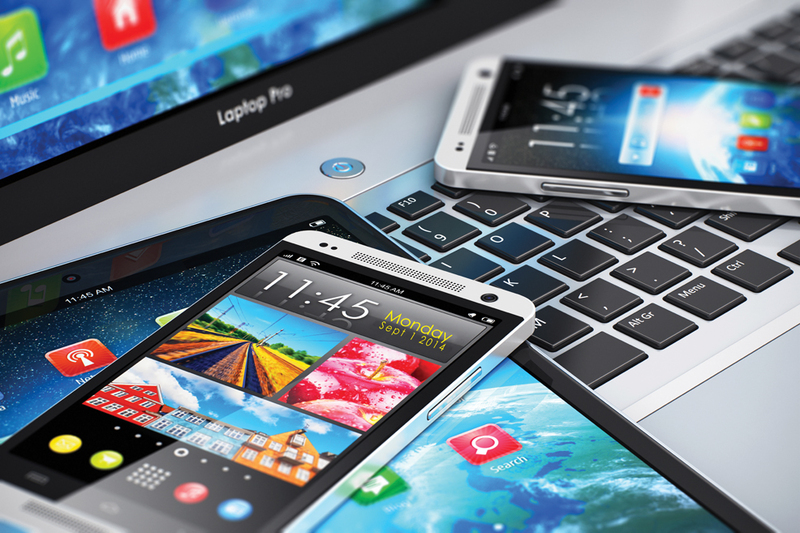 Some are made for multiple devices and can be found in retail stores or through your wireless carrier. Besides the convenience of drop-and-go, you no longer have to worry about wear and tear on your device’s charging socket that can often break and render it unusable. You do, however, interrupt charging when you have to move your device—for example, to pick it up quickly for a call—and the mats may not be as efficient as direct connections to electrical outlets, so it is unpredictable if this new technology will be the end-all. Now that you have some options, it is time to assemble your troops and plan your strategy for conquering the cords. Make “neat and tidy” your battle cry.